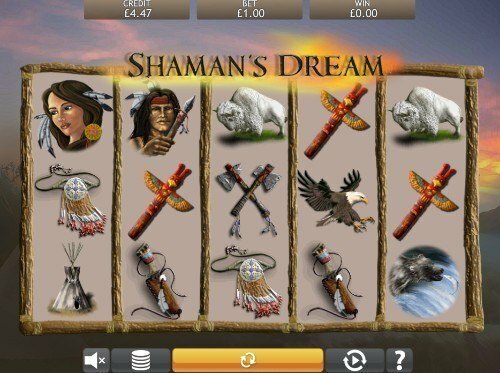 Shaman's Dream is a 5 reel, 25 pay line game with a Native American theme made by Eyecon Gaming. It has a 95.44% RTP with Free Games Bonus Round. Unlock the history of the Native Americans with Eyecon’s eye-grabbing slot. Expect plenty of action with the 3 x 5 reel grid, 25 different ways to win, and an RTP of 95.44%. Shaman’s Dream has also been incredibly generous with the free spins and 50 / 50 gamble feature! With Shaman’s dream, Eyecon have moved away from their usual cute and cuddly style to dig deep in the cultural roots of Native Americans. While they are still around today, Shaman’s Dream transports you right back in time – before colonists came for their land. But we’ll keep colonisation out of the conversation, because there is still plenty to celebrate from Shaman’s Dream which will reignite your youth, or all the time you spent playing cowboys and Indians. You’ll get to match plenty of themed symbols which will allow you to learn a little about the spirituality of the Native American tribes. There’s probably no way to make a faster connection to nature while looking at a screen! Whether you choose to play on mobile or laptop or desktop, you’ll be in for an immersive treat with Shaman’s dream. There may not be a whole lot going on with the reels graphics wise, but the simplicity makes Shaman’s Dream a brilliant game to slip into and spin the reels on. You’ll get to see all of the interesting symbolism which Shaman’s Dream so accurately depicts. The graphics and symbols may be 2D, but Eyecon always have a way of creating their games with a touch of authenticity. The main feature of Shaman’s Dream is the Shaman, which seems fairly obvious given the title. But what actually is a Shaman? Shamanism is defined as a system which involves emotional, psychic and spiritual healing. They don’t just live in our world, nope. They also live in a non-material world. Perhaps the most interesting part of Shamanism is the fact that it is practiced all over the world! While it may seem the making of a fantasy novel or film, Shaman’s are said to have used different animals to be transported with the spiritual world – which is why you always see Native American’s so strongly associated to animals such as wolves. Through travelling the astral planes, they were said to be individuals which possessed great amounts of knowledge, power and spirituality. By now, I’m sure you can see that Shamanism is a deeply interesting game to play, you can definitely tell that Eyecon had a lot of fun creating the online slot. Even though Shamanism happens all over the world, the setting for this particular slot is North America, where there are still plenty of Native American’s practicing their traditions still today! Of course, not all Native Americans live as you see depicted in Shaman’s Dream. But still, there’s not an iPhone in sight on the symbols on the reels, so it’s safe to say that as well as transporting you to the planes of North you also get thrown back into history. There won’t be much to see on the fairly hazy background of the slots, however, you’ll just be able to make out the craggy rock faces and the sparse lands of North America. Eyecon really didn’t go all out with the theme behind the reels, but through the symbols you will find plenty of symbolism to get you in the mood to appreciate what the North American cultures have to offer. Even the reels are constructed with a rickety wooden frame which adds to the overall theme of the online slot. Eyecon have gone with the usual approach with their soundtracks and have kept it fairly minimal, the sound effects only ring through when you make a winning combo on the reels. As cathartic as pan pipe music can be, it can be a little draining if you’re playing it for hours on end. Now we’ve got to grips with just what Shaman’s Dream is all about, it’s now time to introduce you to the gameplay experience which has made this slot as popular as it is today. It may not be as renown as the Fluffy Favourites franchise yet, but it will certainly go down in slot machine history as being the best slot game dedicated to Native American culture. A fairly typical move of Eyecon is to leave standard symbols off the reels, so with Shaman’s Dream, you’ll only see a few symbols which will give you plenty of clues how the Native American tribes lived! There are 12 symbols which you will need to understand to Shaman’s Drea. The symbols include: rusty sheathed dagger, traditional tribal jewellery, the wigwams Shaman’s would call home, crossed axes, a Native American girl, an eagle, tomahawks, and the one you will definitely want to watch out for is the Shaman. The Shaman also has his very own special assistant who you’ll see when the Shaman doesn’t feel like showing his face. No self-respecting game set in North America should ever be lacking a wolf, so Eyecon included the Wolf as the wild card of the way, which is fairly fitting given their wild nature – well played Eyecon! The wild will follow the usual rules of replacing all other symbols on the reels – aside from the scatter symbol. You’ll have a nice boost to any win made with the wild, it will double in fact! If you’ve already spent a fair amount of time spinning the reels on Eyecon slots, you will appreciate this feature is quite standard. So there’s really not much new about Shaman’s Dream, aside from the awesome theme! The scatter card is represented by the dreamcatcher and will trigger the bonus round if you find three or more on the reels. We’ll cover the bonus round feature more down below – there isn’t much to say as they’ve kept with the more classic bonus features, but the bonus features are just part of the charm of Shaman’s Dream! The 5 x 3 reel slot has 25 different pay lines, play on them one, or play on all of them to increase your chances of cashing out with a nice and tidy jackpot bonus. You’ll be able to play from as little as 25p with the highest stake amount set at £12.50. So, Shaman’s Dream probably isn’t for anyone looking to put down serious amounts of money on the slot, but for low to med-size budgets you’ll have plenty of fun with the bonus round and multipliers with this game. There’s definitely a lot to play for with the 9,500 coin jackpot. Maybe you could even afford a trip to North America to check out the culture for yourselves if you won the jackpot! The jackpot may not be all too sizeable in comparison to other online slots, but Shaman’s Dream is still a solid all-round slot. If you’re looking for a showstopping bonus round, you may be a little disappointed. That being said, many people love free spins rounds, and why shouldn’t they? Spinning for free is a massive thrill, especially when you can walk away with massive cash prizes from the free spins round. Every time you see three or more dreamcatcher symbols on the reels you will trigger the bonus round! Eyecon have kept it really simple with Shaman’s Dream and the bonus, but there’s a bonus in the fact that it is so easy to come away from the bonus rounds feeling flush! You can win up to 400 free spins on Shaman’s Dream! That’s plenty of chances to make a winning combination. You’ll be even happier if you create a winning combo using a wildcard! Because each win you make in the free spins round will be trebled. But if you create a winning combination with a wild, it will be doubled once more! Allowing you to win up to 380x your original stake amount which you used when you first entered the round! The number of initial free spins that you will win depends on how many dreamcatchers you find to trigger the round. To gain even more when you are playing the free spins feature, you’ll just need to find more scatter symbols. Another typical Eyecon bonus feature is the 50 / 50 gamble feature which you will be able to take advantage of with every win! It’s up to you if you use it, we’d probably advise to only use it if you feel like you’re on a winning streak as if you lose you will lose your entire bet. Otherwise, you get 100% more. Some say that you make your own luck, so make sure you speak to your spirit guides and ask them nicely to allow you to win with a massive jackpot! Eyecon are one of the most well-establish online slot developers in the world. Even though they may only have around 60 slot titles to date, those titles are some of the most commonly played on Money Reels! Of course, we’re not the only online casino to feature their games – but we still like to give our players plenty of added perks to playing with us. Eyecon are one of the most popular game’s providers for the UK, but their popularity doesn’t stop there, their reels have been spun literally billions of times in a variety of different languages, jurisdictions and countries. It all started out with their inception in 1997, back when most people didn’t even have internet in their homes! But they didn’t start off with an online slot back then, instead, they went with a far more conventional videogame ‘Gore’, sensing that online slots were the next big thing, they created their first ever online slot ‘Temple of Isis’ which was later renamed to ‘Temple of Iris’ which is still commonly enjoyed today! It’s safe to say that they made a pretty big jump from horror videogames to cute and cuddly online slots. Which was made very apparent when they brought out their most successful slot yet, just three years after the release of Temple of Iris. Fluffy Favourites is a game that pretty much everyone is aware of – even if they don’t play online slots! Eyecon have perceptibly never intended to create slots which look ultra modern, they already know that people are going to be playing them for years to come! It may be disputable which game developer is the biggest, but Eyecon have definitely got one of the highest staying powers of the slot world! You’ll be able to expect a lot more from Eyecon in the future as they are slowly but surely increasing their production output and adding to the 60 successful games which are already included in their portfolio. As they have global offices, they were more than prepared for global dominance. Eyecon offices started out in Australia and Guernsey, but there’s no knowing where they will end up. Back to Shaman’s Dream, here’s what Eyecon had to say about the perpetually-popular slot over on their website where you can give the online slot game a go for yourselves! Eyecon seem as stoked about Shaman’s Dream as we are here at Money Reels! Eyecon are pretty clever when it comes to creating online slots. They Know what works, and they run with it. Which is why they have created four online slots with the Shaman’s theme. So, if you’re looking for a little variance in the gameplay, you’ve got three more alternatives to choose from – Eyecon really do like making sure that they have the best number of games on offer so their players can easily find a firm favourite! Creating jackpot versions of formerly successful online slots is a fairly typical move from slot developers, so it should have been no surprise that Eyecon brought out Shaman’s Dream Jackpot version after they saw how successful they were with the original. You can expect a very similar gameplay experience, with the exception of the opportunity to win a progressive jackpot. Progressive jackpots are constantly growing and are fed into by players all around the world. With the added perk of winning the max jackpot of £32,000 you will see the RTP drop a little from the original. But for some players, it’s all about the life-changing sums of money! The original Shaman’s dream jackpot definitely the biggest, but the volatility definitely works in its favour. There are more similarities to Shaman Spirit slot than there are differences when put in comparison to Shaman’s Dream. You can expect a slight aesthetic twist to the visual side of the game. While the visuals are bright and crisp, the shamanistic culture is a little more diluted thanks to the slot game having fewer themed symbols, but if you’re looking for a more basic gaming experience, and you’re not all too bothered about the theme, then the RTP sitting at a generous 95.4% is definitely a perk to play for! There is also a jackpot version of Shaman Spirit, just as you saw with Shaman’s Dream. Once again, the RTP is lower, but the progressive jackpots will give you the chance to win some impressive wins! When it comes to Eyecon’s Native-themed slot games, there isn’t a massive amount of variation. So, if you’re looking for something completely different, there are definitely plenty of options from some of the other major online slot developers. There are a fair few available online to play today. But we’ve made it easy for you by picking the top three best online slots which celebrate Native American culture. They all seem to have their own particular perks and charm – the best game for you will depend on your playing preferences! Animals are a massive part of Native American culture, so Pragmatic Play took the focus of their Shaman-themed slot away from the Shaman’s and gave it to their spiritual guides instead. Anyone who is a massive fan of North American wildlife will definitely find plenty of appeal on the reels of Pragmatic Play’s best Native themed slot. Wolf Gold slot is one of the most popular adventure themes slots there is, glowing reviews came pouring in for the slot, it also picked up plenty of rewards after the release! You’ll get more bonus features than you got with Shaman’s Dream, and a much higher return to player rate of 96%. We wouldn’t be surprised if the online slot is still around in years to come! Following a similar theme to Wolf Gold, Wolf Run also celebrates one of the most popular icons of a Shaman’s culture. The background will transport you the barren open lands of North America where you’ll see a few totem poles knocking around, and plenty of animals which are so important to Shamanism. Sadly, the graphics are fairly dated, so anyone looking for a HD experience may be a little disappointed, but with a reasonable return to player rate of 94.98% there’s plenty to play for across the 40 different pay lines. Undeniably the best features are the stackable wilds which make the pay outs fairly frequent as well as being fairly generous. Totem Poles are also a fairly integral part of Shaman culture, so Microgaming created an online slot specially dedicated to them! Microgaming put a fun little twist on Totem Treasure by keeping it really simple, but also clever enough to make the gameplay immersive. You’ll get your average 5 x 3 slot grid, but as you spin the reels you will get to form your very own totem poles! It definitely adds a different element to the slot. There are only 20 different ways to win the game, but the totem pole building gives the game a nice dynamic. If you pair the fun twist with a generous RTP of 96% and the fact that the game offers a progressive jackpot, Totem Treasure may just be the best alternative to Shaman’s Dream! The only slight drawback to the game is the quality of the graphics which seem to be a little dated. But for big wins and frequent wins, it’s a solid choice which is also really fun to play! When it comes to Eyecon’s online slots, you will never be disappointed when you move away from the laptop and start to play on mobile. Eyecon probably wouldn’t have celebrated the success which they have seen today if they weren’t as committed to ensuring that their games weren’t enjoyable on mobile. When checking out Shaman’s Dream on mobile, there were absolutely no complaints! The graphics are just as sharp, and the gameplay is just as seamless, the only difference is that the visuals are a little different due to the backdrop being more visible. Gaming news is always fairly on the sparse side sadly, but Shaman’s Dream still got included on the line up of VENTS Magazine’s list of ‘most spiritual themed slots. So, it’s not just us who appreciated the mysticism and adventure involved in Shaman’s Dream. Here’s what they had to say about Shaman’s Dream. “The 5-reel, 25-payline slot game is perhaps one of the spiritual slot game which will immerse you in the folklore and history of the Native Indians the most. The slot is designed to take you back in time to provide a learning experience as well as the exhilaration you will feel from winning the bonus rounds! If you’d like a simpler game play experience, there is always the Autoplay feature provided by Eyecon games. Enabling the feature is up to you, you can always sit back in awe of the sunset which features in the background along with the fun symbols including dream catchers, wolves, eagles and swords”.